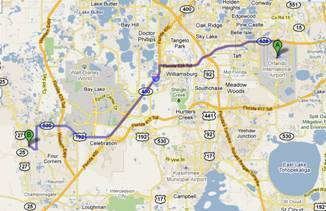 From Orlando International Airport – Take I-4 West toward Tampa/Disney World for 6.9 miles. Take US-192 West/W Irlo Bronson Memorial Hwy/Exit 64 toward Magic Kingdom/Disney MGM for 9 miles. Take US-27 South toward Haines City for 2.1 miles. Turn left on Florence Villa Grove Road, go 0.4 mile. Turn right on Vista View Drive to gated entrance to VistaPark Resort. From Tampa – Take I-4 East to US-27/Exit 55. Go North on Highway 27 toward Clermont for 6.5 miles. Turn right on Florence Villa Grove Road and go 0.4 mile. Turn right on Vista View Drive to gated entrance to VistaPark Resort. From Disney – Proceed West on US-192 to Highway 27. Go South on Highway 27 for 2.1 miles. Turn left on Florence Villa Grove Road and go 0.4 mile. Turn right on Vista View Drive to gated entrance to VistaPark Resort. There is a large choice of retail/outlet shopping, restaurants and supermarkets all within a few minutes drive from our home.